A Whooping Crane, accompanied by Sandhill Cranes, above McHenry County, Illinois, during autumn migration, November 15, 2017. Photo by Ken Wick. Last Sunday was clear and cold, with a brisk breeze out of the north: perfect weather to support the migration of one of North America’s largest birds, the Sandhill Crane. At home that day, I could hear the unmistakable sound of bugling cranes filtering through the closed windows of my house. 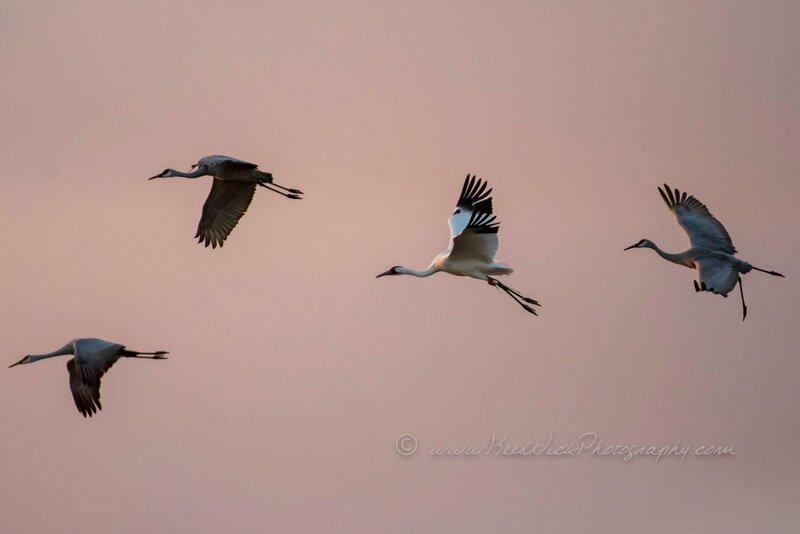 Cranes call to one another in flight, keeping in close contact as they make their migratory way up and down the central corridor of the continent following the seasons. Their clarion calls can be heard for miles, a guttural sound that can be described as profoundly primordial. As I do every year, I ran out the door and stood, shivering, craning my neck (pun intended) to view the majestic birds as they swirled and careened above me, “kettling” as they sought a fresh thermal to carry them along on their continuing southward journey. My early exposure to Sandhill Cranes occurred years ago while I was living in central Wisconsin. There were woodlands, prairie remnants and hayfields, along with a crescent of wetland, surrounding the house that I lived in. I would slip out of the house in the morning, startled to find Sandhill Cranes, tall as deer, standing in the fields, gleaning insects and seeds. They would fly low over the house, like some prehistoric dream creatures, dropping in to land nearby. I was captivated. Two species of cranes occur in North America; their respective stories seem at first to be at odds, but my hope is that the relative abundance of Sandhill Cranes today may presage the recovery of the endangered Whooping Crane. As recently as the 1930s there were but a couple dozen nesting pair of Sandhills throughout the whole state of Wisconsin. They were absent from Illinois until later in the century. Now, no longer over-hunted, Sandhill Cranes have seen their population numbers rebound dramatically over the past several decades. The International Crane Foundation in Baraboo, Wisconsin, estimates today’s population of Sandhill Cranes (including all five subspecies) to number more than 650,000 and increasing. The fate of their larger cousin, the Whooping Crane, remains in question. The total number of Whooping Cranes in the world today is just 612, including 161 that are in captivity. Yet, that is a great improvement; the Whooping Crane population reached an all-time low of just 21 individuals in 1944, perilously close to extinction. Recovery has been gradual: in the 1970s the population remained precariously low, at about 50 birds; by the late 1980s there were more than a hundred Whooping Cranes. Federal protection, habitat improvements, captive breeding, and assisted migration have contributed to the recovery process. Sadly, illegal shootings still claim Whooping Cranes every year; more troubling is the revelation that most such takings are intentional, with shooters well aware that they are taking a protected species. Other threats to Whooping Cranes include hazards of migration, such as predation and power lines. Nest disturbances can inhibit reproduction, as can low genetic diversity caused by the depletion of the population in the 20th century. The eastern migratory population of Whooping Cranes numbers 93 individuals that mingle with the Sandhill Cranes in mixed flocks during spring and fall migration, traveling over northern Illinois and southern Wisconsin twice a year. The Whoopers are easily discerned as they are bright white, with black wing tips and are noticeably larger than the gray or brownish Sandhills. While Sandhill Cranes typically may be 4 to 4 ½ feet tall, Whoopers can attain a height of 5 feet. We’ve seen (or more probably heard) Sandhill Cranes migrating across northern Illinois for decades, but for many years they did not nest south of the Wisconsin state line. Setting them on the road to recovery, Sandhill Cranes in 1989 were listed as Endangered in Illinois. In 1999 their improved status was listed as Threatened. They were delisted in 2009. For the past dozen or so years I have taken part in the annual Crane Count organized by the International Crane Foundation. This Citizen Science initiative has helped generate a clearer picture of crane population trends throughout the Midwest. Today, among the northern-tier counties of Illinois, Winnebago County reportedly has the highest count of Sandhiill Cranes with 429 observed this past spring. (For comparison, the count revealed 51 cranes in McHenry County and 63 in Lake County.) The fact that we now see Sandhill Cranes during the summer, rearing their young, is testimony to the success of our conservation efforts. With continued efforts toward protection, habitat improvement, and public education, it is hoped that Whooping Cranes will follow the example set by the recovery of Sandhill Cranes. Our lives will be wilder and much enriched thereby.